The Zhou dynasty (Chinese: 周; pinyin: Zhōu [ʈʂóu]) was a Chinese dynasty that followed the Shang dynasty and preceded the Qin dynasty. The Zhou dynasty lasted longer than any other dynasty in Chinese history (790 years). The military control of China by the royal house, surnamed Ji, lasted initially from 1046 until 771 BC for a period known as the Western Zhou and the political sphere of influence it created continued well into Eastern Zhou for another 500 years. During the Zhou Dynasty, centralized power decreased throughout the Spring and Autumn period until the Warring States period in the last two centuries of the Zhou Dynasty. In this period, the Zhou court had little control over its constituent states that were at war with each other until the Qin state consolidated power and formed the Qin dynasty in 221 BC. The Zhou Dynasty had formally collapsed only 35 years earlier, although the dynasty had only nominal power at that point. This period of Chinese history produced what many consider the zenith of Chinese bronze-ware making. The Zhou dynasty also spans the period in which the written script evolved into its almost-modern form with the use of an archaic clerical script that emerged during the late Warring States period. According to Chinese mythology, the Zhou lineage began when Jiang Yuan, a consort of the legendary Emperor Ku, miraculously conceived a child, Qi "the Abandoned One", after stepping into the divine footprint of Shangdi. Qi was a culture hero credited with surviving three abandonments by his mother and with greatly improving Xia agriculture, to the point where he was granted lordship over Tai and the surname Ji by his own Xia king and a later posthumous name, Houji "Lord of Millet", by the Tang of Shang. He even received sacrifice as a harvest god. The term Hòujì was probably a hereditary title attached to a lineage. Qi's son, or rather that of the Hòujì, Buzhu is said to have abandoned his position as Agrarian Master (Chinese: 農師; pinyin: Nóngshī) in old age and either he or his son Ju abandoned agriculture entirely, living a nomadic life in the manner of the Xirong and Rongdi (see Hua–Yi distinction). Ju's son Liu, however, led his people to prosperity by restoring agriculture and settling them at a place called Bin,[c] which his descendants ruled for generations. Tai later led the clan from Bin to Zhou, an area in the Wei River valley of modern-day Qishan County. The duke passed over his two elder sons Taibo and Zhongyong to favor Jili, a warrior who conquered several Xirong tribes as a vassal of the Shang kings Wu Yi and Wen Ding before being treacherously killed. Taibo and Zhongyong had supposedly already fled to the Yangtze delta, where they established the state of Wu among the tribes there. Jili's son Wen bribed his way out of imprisonment and moved the Zhou capital to Feng (within present-day Xi'an). Around 1046 BC, Wen's son Wu and his ally Jiang Ziya led an army of 45,000 men and 300 chariots across the Yellow River and defeated King Zhou of Shang at the Battle of Muye, marking the beginning of the Zhou dynasty. [d] The Zhou enfeoffed a member of the defeated Shang royal family as the Duke of Song, which was held by descendants of the Shang royal family until its end. This practice was referred to as Two Kings, Three Reverences. Over time, this decentralized system became strained as the familial relationships between the Zhou kings and the regional dynasties thinned over the generations. Peripheral territories developed local power and prestige on par with that of the Zhou. When King You demoted and exiled his Jiang queen in favor of the beautiful commoner Bao Si, the disgraced queen's father the Marquis of Shen joined with Zeng and the Quanrong barbarians to sack Hao in 771 BC. Some modern scholars have surmised that the sack of Haojing might have been connected to a Scythian raid from the Altai before their westward expansion. With King You dead, a conclave of nobles met at Shen and declared the Marquis's grandson King Ping. The capital was moved eastward to Wangcheng, marking the end of the "Western Zhou" (西周, p Xī Zhōu) and the beginning of the "Eastern Zhou" dynasty (东周, p Dōng Zhōu). The Eastern Zhou was characterized by an accelerating collapse of royal authority, although the king's ritual importance allowed over five more centuries of rule. The Confucian chronicle of the early years of this process led to its title of the "Spring and Autumn" period. The partition of Jin in the mid-5th century BC initiated a second phase, the "Warring States". In 403 BC, the Zhou court recognized Han, Zhao, and Wei as fully independent states. Duke Hui of Wei, in 344 BC, was the first to claim the royal title of king (Chinese: 王) for himself. Others followed, marking a turning point, as rulers did not even entertain the pretence of being vassals of the Zhou court, instead proclaiming themselves fully independent kingdoms. A series of states rose to prominence before each falling in turn, and Zhou was a minor player in most of these conflicts. The last Zhou king is traditionally taken to be Nan, who was killed when Qin captured the capital Wangcheng in 256 BC. A "King Hui" was declared, but his splinter state was fully removed by 249 BC. Qin's unification of China concluded in 221 BC with Qin Shihuang's annexation of Qi. The Eastern Zhou, however, is also remembered as the golden age of Chinese philosophy: the Hundred Schools of Thought which flourished as rival lords patronized itinerant shi scholars is led by the example of Qi's Jixia Academy. The Nine Schools of Thought which came to dominate the others were Confucianism (as interpreted by Mencius and others), Legalism, Taoism, Mohism, the utopian communalist Agriculturalism, two strains of Diplomatists, the sophistic Logicians, Sun-tzu's Militarists, and the Naturalists. Although only the first three of these went on to receive imperial patronage in later dynasties, doctrines from each influenced the others and Chinese society in sometimes unusual ways. The Mohists, for instance, found little interest in their praise of meritocracy but much acceptance for their mastery of defensive siege warfare; much later, however, their arguments against nepotism were used in favor of establishing the imperial examination system. Zhou rulers introduced what was to prove one of East Asia's most enduring political doctrines. The concept of the "Mandate of Heaven". They did this so by asserting that their moral superiority justified taking over Shang wealth and territories, also that heaven had imposed a moral mandate on them to replace the Shang and return good governance to the people. The Mandate of Heaven was presented as a religious compact between the Zhou people and their supreme god in heaven (literally the 'sky god'). The Zhou agreed that since worldly affairs were supposed to align with those of the heavens, the heavens conferred legitimate power on only one person, the Zhou ruler. In return, the ruler was duty-bound to uphold heaven's principles of harmony and honor. Any ruler who failed in this duty, who let instability creep into earthly affairs, or who let his people suffer, would lose the mandate. Under this system, it was the prerogative of spiritual authority to withdraw support from any wayward ruler and to find another, more worthy one. In this way, the Zhou sky god legitimated regime change. In using this creed, the Zhou rulers had to acknowledge that any group of rulers, even they themselves, could be ousted if they lost the mandate of heaven because of improper practices. The book of odes written during the Zhou period clearly intoned this caution. The early Zhou kings contended that heaven favored their triumph because the last Shang kings had been evil men whose policies brought pain to the people through waste and corruption. After the Zhou came to power, the mandate became a political tool. One of the duties and privileges of the king was to create a royal calendar. This official document defined times for undertaking agricultural activities and celebrating rituals. But unexpected events such as solar eclipses or natural calamities threw the ruling house's mandate into question. Since rulers claimed that their authority came from heaven, the Zhou made great efforts to gain accurate knowledge of the stars and to perfect the astronomical system on which they based their calendar. Zhou legitimacy also arose indirectly from Shang material culture through the use of bronze ritual vessels, statues, ornaments, and weapons. As the Zhou emulated the Shang's large scale production of ceremonial bronzes, they developed an extensive system of bronze metal working that required a large force of tribute labor. 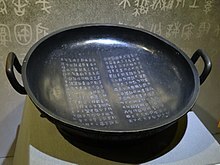 Many of its members were Shang, who were sometimes forcibly transported to new Zhou to produce the bronze ritual objects which were then sold and distributed across the lands, symbolizing Zhou legitimacy. King Zhao was famous for repeated campaigns in the Yangtze areas and died in his last action. Later kings' campaigns were less effective. King Li led 14 armies against barbarians in the south, but failed to achieve any victory. King Xuan fought the Quanrong nomads in vain. King You was killed by the Quanrong when Haojing was sacked. 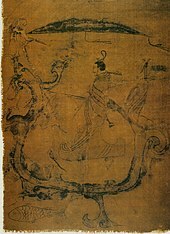 Although chariots had been introduced to China during the Shang dynasty from Central Asia, the Zhou period saw the first major use of chariots in battle. Recent archaeological finds demonstrate similarities between horse burials of the Shang and Zhou dynasties and Indo-European peoples in the west. Other possible cultural influences resulting from Indo-European contact in this period may include fighting styles, head-and-hooves burials, art motifs and myths. Established during the Western period, the Li (traditional Chinese: 禮; simplified Chinese: 礼; pinyin: lǐ) ritual system encoded an understanding of manners as an expression of the social hierarchy, ethics, and regulation concerning material life; the corresponding social practices became idealized within Confucian ideology. The rulers of the Zhou dynasty were titled Wáng (王), which is normally translated into English as "king" and was also the Shang term for their rulers. In addition to these rulers, King Wu's immediate ancestors – Danfu, Jili, and Wen – are also referred to as "Kings of Zhou", despite having been nominal vassals of the Shang kings. In traditional Chinese astrology, Zhou is represented by two stars, Eta Capricorni (週一 Zhōu yī, "the First Star of Zhou") and 21 Capricorni (週二 Zhōu èr, "the Second Star of Zhou"), in "Twelve States" asterism. Zhou is also represented by the star Beta Serpentis in asterism "Right Wall", Heavenly Market enclosure (see Chinese constellation). ^ Fenghao is the modern name for the twin city formed by the Western Zhou capitals of Haojing and Fengjing. ^ The exact location of Wangcheng and its relation to Chengzhou is disputed. According to Xu Zhaofeng, "Chengzhou" and "Wangcheng" were originally synonymous and used to name the same capital city from 771 to 510 BC. "The creation of a distinction between Wangcheng and Chengzhou probably occurred during the reign of King Jing", under whom a new capital "Chengzhou" was built to the east of the old city "Wangcheng". Nevertheless, the new Chengzhou was still sometimes called Wangcheng and vice versa, adding to the confusion. ^ The exact location of Bin remains obscure, but it may have been close to Linfen on the Fen River in present-day Shanxi. ^ Sima Qian was only able to establish historical dates after the time of the Gonghe Regency. Earlier dates, like that of 1046 BC for the Battle of Muye, are given in this article according to the official PRC Xia–Shang–Zhou Chronology Project, but they remain contentious. Various historians have offered dates for the battle ranging between 1122 and 1027 BC. ^ Bodman (1980), p. 41: "Moreover, Shang dynasty Chinese at least in its syntax and lexicon seems not to differ basically from that of the Zhou dynasty whose language is amply attested in inscriptions on bronze vessels and which was transmitted in the early classical literature." ^ a b c d e "Considering Chengzhou ("Completion of Zhou") and Wangcheng ("City of the King")" (PDF). Xu Zhaofeng. Archived from the original (PDF) on July 22, 2015. Retrieved 22 July 2015. ^ "Encyclopædia Britannica: Tian". Retrieved 17 August 2015. ^ Schinz (1996), p. 80. ^ a b Shijing, Ode 245. ^ "Hou Ji". Encyclopædia Britannica. ^ Sima Qian. Records of the Grand Historian, Annals of Zhou, §3. ^ Wu (1982), p. 235. ^ Shaughnessy (1999), p. 303. ^ Wu (1982), p. 273. ^ David McCraw (2010). "An ABC Exercise in Old Sinitic Lexical Statistics" (PDF). Sino-Platonic Papers (202). ^ Jessica Rawson, 'Western Zhou Archaeology,' in Michael Loewe, Edward L. Shaughnessy (eds. ), The Cambridge History of Ancient China: From the Origins of Civilization to 221 B.C., Cambridge University Press 1999 pp.352-448 p.387. ^ a b Li, Feng (2006), Landscape And Power In Early China, Cambridge University Press, p. 286. ^ Chiang, Po-Yi (1 Jan 2008). "Han Cultural and Political Influences in the Transformation of the Shizhaishan Cultural Complex". Australian National University: 1–2. ^ Shaughnessy (1999), p. 310, 311. ^ a b Chinn (2007), p. 43. ^ Hucker (1978), p. 32. ^ Hucker (1978), p. 33. ^ a b Hucker (1978), p. 37. ^ .Carr, Brian & al. Companion Encyclopaedia of Asian Philosophy, p. 466. Taylor & Francis, 2012. ISBN 041503535X, 9780415035354. ^ a b c L.,, Tignor, Robert. Worlds together, worlds apart. Adelman, Jeremy,, Aron, Stephen,, Brown, Peter, 1935-, Elman, Benjamin A., 1946-, Liu, Xinru,, Pittman, Holly, (Fourth edition, [Two volume edition] ed.). New York. ISBN 9780393922080. OCLC 870312289. ^ a b c Shaw, Robert Tignor, Jeremy Adelman, Peter Brown, Benjamin Elman, Xinru Liu, Holly Pittman, Brent (2014). Worlds together, worlds apart (Fourth edition. ed.). p. 153. ISBN 978-0-393-92208-0. ^ Brashier, K. E. (2011-01-01). Ancestral Memory in Early China. ISBN 9780674056077. ^ ChinaKnowledge.de encyclopedia, http://www.chinaknowledge.de/History/Zhou/zhou-admin.html. [permanent dead link] Alternatively, the sequence was translated as prince, lord, elder, master, chieftain: Brooks 1997:3 n.9. ^ Ebrey, Walthall & Palais (2006), p. 14. ^ Schirokauer & Brown (2006), pp. 25–47. ^ Thorp, Robert L. (2005). China in the Early Bronze Age. University of Pennsylvania Press. p. 176. ISBN 978-0-8122-3910-2. ^ (in Chinese) "AEEA – Astronomy Education Network (天文教育資訊網)" (in Chinese). July 4, 2006. Retrieved December 5, 2010. ^ (in Chinese) "AEEA – Astronomy Education Network (天文教育資訊網)" (in Chinese). June 24, 2006. Retrieved December 5, 2010.